RW: Sure. I live in Hong Kong and I am running a startup business, specializing in coconut oil. Any Tesla owners, ping me and I will give you a special discount. Currently, I own a multi-coat red 85 and it's been a year since I owned it. 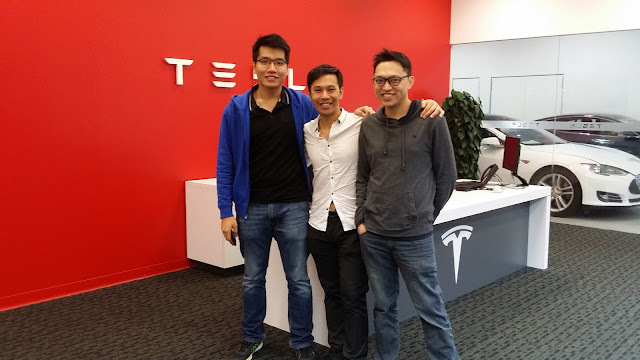 The first time I learned about Tesla was a California visit during Oct 2014. My friend, who invested in Tesla stock, earned herself a Tesla. That's my first Tesla ride. I was strongly attracted by this car, and eventually paid the deposit on January 2015...Actually I already played with the design studio since November 2014, haha. I love driving this car and I almost drive it everyday. LL: You know what, I envy all those friends who can drive their EVs every day. I just don’t have the chance. Okay, back to your story of success. As far as I remember, there are 3 rounds of Tesla Referral Program. The first round is a little more complicated because it came in 2 phases: phase 1 has a limit to just 10 referrals, current owner --the referrer, gets HK$10,000 of referral credits and referree gets HK$10,000 off the purchase price of their new Tesla Model S. Then, as quoted from Tesla’s website, “The first person to refer ten friends in each sales region— North America, Europe, and the Asia-Pacific — will receive a free Model X.” Deadline was till October 31st, 2015. You started slow in this one, am I right? Then you simply went unstoppable! What happened then? Did you win the free Model X? RW: I didn't participate at all during phase 1. I remembered someone suddenly got 10 referrals in a single day and won the game. I believed that he's from mainland China. However, anyone who referred more than 10 people have the right to buy a fully loaded model X at base price (base price of P90D). I know at least 4 people in Hong Kong achieved this goal. LL: Ah! What a pity. Then came first round phase 2, which Tesla removed the 10 referral limit, threw in a Tesla Powerwall for every 5 referrals, and I quote again, “the customer who makes the most referrals by the end of October will be invited to swap their current Model S for a fully loaded Ludicrous P90D Model S, for free.” This one was a tough battle between you and Mr. Frank Lee! Everyone in Hong Kong was keeping an eye on that APAC scoreboard on Tesla app till the final day! In the end, you won! Please tell us more and what was the final result again? RW: This was the time I started to get into the game. At first I just wished to have 5 referrals so I can get the invitation to the gigafactory opening. I started by introducing the car to my friends. Eventually, I started to think, why not sharing this amazing car to all the people on the internet? So I opened a Facebook page, launched a website, and helped people to understand this car and also leave my cell phone number online so that people can text me or call me anytime to ask questions regarding the car. I never imagined that I could move to the first rank! I almost lose to Frank, but on the last day a lot of people which I talked to all rushed in to buy the car! At last I referred more than 80 people. All credits go to Tesla. Most of these people were already interested in the car and I just helped them to understand more of it, listing the pros and cons to them, and provided test rides. LL: And together, you and Frank managed to 164 referrals, that’s 984 tonnes of CO2 saved a year! And above all, you can swap your car for a fully-loaded P90D-L, which is fantastic! When will you get the new car? RW: Currently I am still happily driving my 85. When you see me driving a P90DL, that's when I get a new car! 3) 10 leads gets you to invitation for model 3 unveiling event. Tell us how you did for this round? RW: Frank told me he was not interested in round 2, so I thought I was going to win the second round. I actually just continued what I did in first round, helping people to know about the car. However, this time China was doing very strong. The top referrer is from China and he referred 209 while I referred 114. Although I was ranked no 2 in the world, I lose in the region. Despite of that, I still had the chance to attend the model 3 unveiling event! And I was also glad that China market seems to be picking up. LL: Oh yes, we all want Tesla to do well in China and when they do, China will push renewable energy even harder. Now round 3 ended on April 15th, 2016, this round, there is no referral credits for referrer and has a limit of maximum 3 referrals per current owner, but referrees get HK$8,800 for home charging installation. “One lucky referrer will win a Ludicrous P90D Model X as well as a tour for two of the SpaceX headquarters in Los Angeles, including travel and accommodations.” And “five referrers will win a tour for two of the SpaceX headquarters in Los Angeles, including travel and accommodations.” This time, there was also no scoreboard for us to keep an eye on. And because of your amazing marketing skill, you decided to help other owners, including me, to get 3 referrals! I’m really curious, why you decided to help others? RW: I just think that it doesn't hurt to help other people to have a chance to win. Even after the first and second referral program, I still continued to help people to understand this amazing car. Why not help them to save 8,800 while helping my friends to get a chance to win the lucky draw? LL: Let’s move to the Tesla Model 3 Unveil Event in Hawthorne. You earned those free tickets. Tell me, what was the atmosphere like there? RW: The atmosphere was so good, everyone was so energetic and seems very excited about the unveiling of the new car! There were a lot of Tesla fanboys there! I can tell that because they all wore Tesla t shirts and Tesla jackets. There was also a Model X on display where everyone got so excited and tried to experience the car. However they didn't allow us to play with the falcon wing door. There was also an area where there were some Macs available for people to preorder their Model 3. A lot of people were busy filling up their information there. LL: You saw the car with your own eyes, how does it look different from what we see from the photos? RW: I think the car looks gorgeous. Comparing to the photo, I think the real car created more “wow" effect. You just can't feel the curve simply by looking at the pictures. LL: Some people talk about the trunk opening. What do you think about that? Is it really a problem? Can you suggest a way to improve on that? RW: I don't think it's a big problem. It's just like a normal trunk. Maybe people are so used to the huge trunk of Model S and so used to hatchback. Yes, the trunk size is not ideal, but Elon said the production model will have a bigger trunk and a larger opening, so I don't think it's a factor that we need to worry about. Remember it's a smaller car, so we can't really expect it to have a big trunk. Not to forget, we also have a frunk! LL: How big is the frunk in this prototype as compared to a the new Model S dual motor with HEPA? RW: It's bigger. I think it can fit two small hand carry luggage. The model S frunk is getting smaller and smaller, that's a thing that I don't like about. LL: You then queued up for the test ride of Model 3, how does it feel? What’s the difference from being in a Model S? RW: The queue was super long. I was number 642 in the queue, and I wasn't able to ride on the Model 3 until 00:20! But while waiting for the test ride, there were two Model X and one Model S available for test ride as well. So I rode on a X twice and on a S once. Ludicrous mode is scary but awesome. Let's get back to Model 3. The test ride itself was great. I still think it look weird without the instrument panel, but i think it takes time to get used to it. I still believe that something similar to HUD would be introduced to Model 3. The overhead glass roof still amazed me even after riding on the model X. Plenty of legroom in the front, and the rear is also spacious, considering it's a smaller car. You don't know how much I want that overhead windshield to be introduced into Model S. In the end, this is just a prototype, I can't wait to see part 2 of the unveiling!! LL: Let’s talk more about Model X because that will come to Hong Kong first. It’s got a huge overhead panoramic sunroof, Falcon wing doors 3 rows of seats, new auto-door present mechanism. What do you like about it? RW: The overhead roof is the best thing I like about. The view is fantastic, everyone will love it. The falcon wing door is a hit or miss. Either you will like it or you will hate it. Personally I think it's very cool but I would question about it's reliability. Also it might not be practical in Hong Kong. About the 3rd row seat, at first I think it's not acceptable, because there were not enough leg room (I am 1.75m). But on the other day I got another chance to experience a 7-seater again. This time I found that actually I can make myself enough legroom by moving the second seat forward and straighten up the second seat a bit. Overall I think it's acceptable and comfortable, of course 6 seater would be nicer. The middle seat of second row, however, do not provide enough headroom because of the pillar. Finally let's talk about the auto present. I think it's a cool idea. You approach the car, it will open the door...I couldn't experience it because I didn't have the key fob with me. When you step on the brake, the door will close. So you don't actually need to touch the door at all. Again, don't know if it's practical in Hong Kong. I always think about what if I park at a meter space and just want to refill the meter? Would it open the door for me when I approach the meter just like the door handle of model S will pop out? How much do the door open? Would it slam into the door of the vehicle park beside you? A lot of question raised up in my mind. LL: Will you feel worried if you were driving the X getting into Hong Kong car parks, say Festival Walk car park for Superchargers? RW: I am getting more worry. I have already seen people sharing that their falcon wing door hit the beam in the parking lot. The ceiling height of Festival Walk is okay, as you can set to only open halfway. However, I do think that Tesla need to do more before they introduce Model X into Hong Kong, such as adding more sensors. LL: Oh, I mean the width of the car as compared to the curbed entrance at Festival Walk car park. Because when I drove my Model S there, I think my back wheels went over the curb. The entrance is tight for Model S. Do you think Model X can avoid curb rash there? RW: I think yes, curb rash can be avoided, you just need to be more careful, and might require some skill. Some car park might be trickier, like the one in Cyberport. LL: Oh, I definitely need to work on my skills then. How about the Powerwall? I think you will be receiving a few in the future? How big is it and where do you think we can install it? Given that our homes in Hong Kong are mostly quite small. 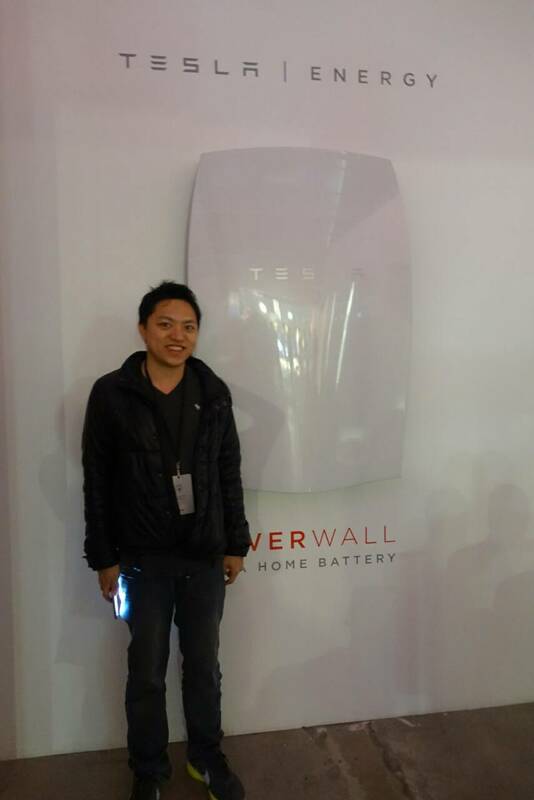 RW: I don't think Powerwall is useful in Hong Kong. It's huge, much bigger than I thought. It's useful if we have different electricity cost during different time, but we don't have that system in Hong Kong. It might also be useful if you live in houses and can install your own solar panel. I don't think much people in Hong Kong will find Powerwall useful. LL: Last but not least, as Tesla’s worldclass referrer, what do you think Tesla should do to ensure success in Hong Kong, and other APAC regions like Taiwan, South Korea and Singapore? RW: They have a huge risk in Hong Kong. Tesla rely heavily on word-of-mouth for its rapid growth, but I think Hong Kong has the worst service satisfaction. We often heard from owners that their car were just sitting in the service centre for a few days for some service that normally just require just a few hours. No loaner car provided. Delivery experiences were not good comparing to the Tesla delivering experience in other countries as well. I think Tesla need to work hard on this part to ensure future success in Hong Kong. As of other regions, I believe Tesla is already planning to enter Taiwan and South Korea. i think government support is the most important key for gaining early success. LL: Thank you very much Raymond for spending so much time with us today! RW: Thank you again for inviting me to this interview!